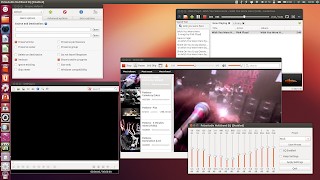 Ubuntu 12.10 beta 1 was released almost two weeks ago and many Ubuntu users have already upgraded, so it's time to make the packages from the WebUpd8 PPAs available for the latest Ubuntu 12.10. And a note: The gstreamer bug that prevents Minitube (and other apps) from working properly still exists in Ubuntu 12.10. See a fix HERE. Obviously, I haven't updated the packages which are already available in the official Ubuntu 12.10 repositories (the latest version). The GNOME 3 WebUpd8 PPA will probably be discontinued, since it was created back when various GNOME3 applications were missing from the Ubuntu repositories and when it wasn't easy to install GNOME Shell extensions (now you can use extensions.gnome.org). Also, the themes available in our Themes PPA haven't been uploaded for Quantal yet because they haven't been updated by their developers to work with the latest GTK 3.6 beta.